It can’t possibly be September already. Wasn’t it just Easter? What happened to the Fourth of July? I was going to spend this summer at the beach (yep, still milky white here), drinking mint iced tea (I think I made one pitcher), and lounging poolside (I forgot that mothers of two year olds are not allowed the luxury of lounging). I want my summer back! I’m not ready to banish my white pants to the back of the closet. I NEED MY CORONAS. My calendar and the back-to-school traffic on my commute are presenting incontrovertible evidence, however, that summer is on the wane. I can cling to the last vestiges by continuing to eat potato salad, and cobbler, and, of course, zucchini. These cakes are my hands-down favorite zucchini recipe. 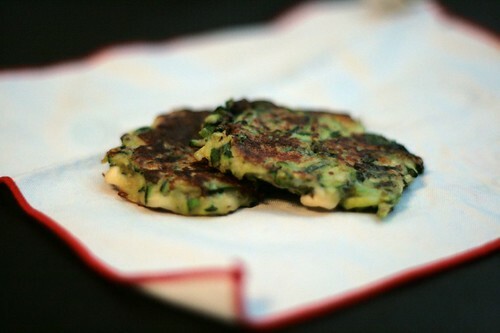 I love them so much that not only do I make them when the zucchini is cheap at the markets, but I buy zucchini in the depths of winter just to make these fritters. I love the flavors. I love that, unlike most fritters, these are excellent served at room temperature, which means that you don’t need to slave over a hot stove to eat them (OK, there is some slaving, but the pleasure of eating can be sufficiently temporally separated from the rigors of cooking that you can actually enjoy your food). I love that they make excellent lunchbox fodder for me, and occasionally for the Nuni (I can’t in good conscience say she loves them, but she ate them twice, and in toddler world that’s equivalent to a thumbs up). And I love that whenever I eat them, I can close my eyes and pretend I’m sitting on some flower-bedecked terrace in the Mediterranean somewhere in the middle of summer. Coarsely grate the zucchini and spread on a clean dishtowel. Sprinkle lightly with salt and allow to dry for at least 20 minutes (this draws some of the water out of the zucchini, rendering the cakes less soggy). 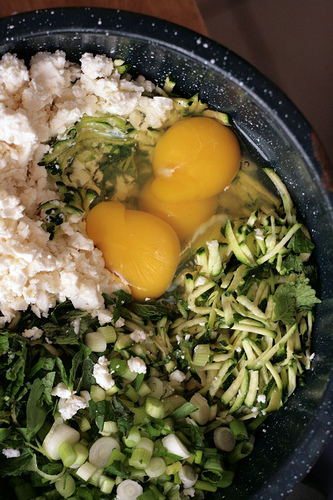 In a medium bowl, combine the scallions and the crumbled feta. Add the parsley, fresh mint, dried mint and paprika. Add the flour, season with pepper and a little salt, then add the eggs (beating them lightly as you add them) and mix thoroughly before adding the zucchini. The batter should be straggly and lumpy and distinctly un batter like. Heat enough oil to coat the bottom of your frying pan, and drop tablespoons of the zucchini mixture in the oil. Cook for about 2 minutes or until pale golden brown, then flip and flatten. Cook for another two minutes, or until that side is medium golden brown, then flip again to finish the first side and the uncooked bits that bulged out when you flattened them. Drain on a paper towel, and serve at room temperature. These will keep for a few days in the fridge. From Nigella Lawson's Forever Summer Don't be put off by the large ingredient list and long directions. These are fairly simple and come together relatively quickly. I know what you mean about summer – it’s flown by so quickly. Good thing there’s still some summer produce in the markets though. I will be making these asap, especially since I bought 4 lbs of feta in bulk.